Do you want to improve your hand eye coordination and dexterity? 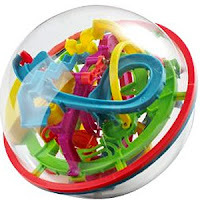 The AddictABall features 138 stages and will keep you amused or addicted for hours! Starting at stage 1, make the ball follow the maze without dropping off the puzzle and follow the stages till you reach the end, it could take a while! Don't worry, if you fall off there's also cheat stages where you can join the game part way through. Have you got the skill needed to guide this ball bearing through the maze? Then this is the puzzle for you. It is frustrating, has reduced my nine year old to tears, my sixteen year old using language that should not said in front of his mother, and me a tad over 21 sulking like a five year old, but we love it and even after having it for over two months one of us is always playing with it. Some times we leave it for days but its like it calls to you and you just have to give it another try to see if you can get a little further. It really is addictive but is so much fun. I gave up smoking just before we got it and it helped as it gave my hands something to do and while concentrating on this i could forget about cravings. It also provides a great source of amusement as anyone who comes to our home gives it a try and it is always fun to see grown men reduced to a petulant five year old while exclaiming there must be something wrong with it. If you want to get your kids something that does not need batteries or needs to be plugged in then this is the one for you.